Men’s basketball teammates Seth Hinrichs, Joey Ptasinski and Dan Trist share more than being 1,000-point scorers. All three seniors are initiates of Lafayette’s Oaks Leadership Academy, a distinction they credit with helping the Leopards defeat American University 65-63 Wednesday for the Patriot League Championship and a berth in the NCAA tournament. In the heat of the game—and there was plenty of friction during the sold-out match-up at Kirby Sports Center—the trio said their training from Oaks is what helped them stay clear headed during the second half when American went on a scoring tear. “In the academy, we talk about staying positive and bringing everybody together,” said Trist, one of two unanimous selections for First Team All League and a member of the All Tournament Team. “Dan, Joey, and I were good about being calm and confident. If you’re flustered and panicked, no one will follow. It’s about keeping your head and staying cool,” he said after the game. Made possible by the Dr. Wilbur Wilson Oaks ’51 Leadership Development Fund, the Leadership Academy is designed to develop, challenge, and support Lafayette student-athletes and coaches in their quest to become effective leaders in academics, athletics, and life. It began in 2010, after Bruce McCutcheon, director of athletics, heard a presentation at Janssen Sports Leadership Center about the importance of developing leadership skills in student-athletes. Cynthia Oaks Linville ’80 and Judson Linville ’79 agreed to fund the program in honor of Cynthia’s father, Dr. Wilbur Oaks ’51. Hinrichs said academy instructor Greg Shelley held a meeting before the playoffs to help calibrate players’ mindset. 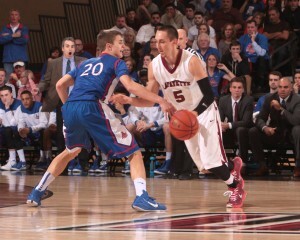 Joey Ptasinski ’15 dribbles the ball while an American University player defends. 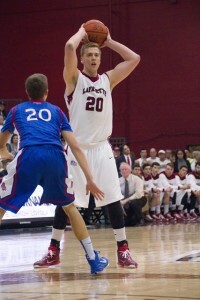 Hinrichs and Ptasinski were named to the men’s basketball Academic All-Patriot League team. Ptasinski is the third student-athlete in Patriot League history to earn Academic All-League status for a third time. A biology major from Colorado, Ptasinski suffered a minor leg cramp that left him sidelined for part of the second half, but he knew from his Oaks training that he had to stay positive for his teammates. “It benefits the whole team, not just us,” he added.